Includes Two 1-Button Remotes that can activate the remote start from up to 1500' away. To Remote Start the vehicle, press and release the remote button 2 times within 2 seconds. The vehicle's parking lights will flash 1X indicating that the remote starter has been activated. Then within 3-5 secs. the vehicle will start and remain running for the pre-programmed 5, 10, 15, 20, 45 or 60 minute run cycle depending on the setting you choose. Heat/AC Activation: The system will apply power to the vehicle's Heater & AC circuit to run the vehicle's windshield defroster in the winter or cool down the interior running the AC in the summer. As a visual indication, depending on the setting you choose, the vehicle's parking lights will flash or remain on while the vehicle is running via the remote starter. Valet Mode: Valet Mode is used to temporarily disable the remote starter system. Shutting Down the remote start before the run time elapses: To shut down the remote start before the run time expires, press and release the remote button the same way you did to activate it. “Quick-Stop” Feature: If you want to make a short stop and keep your vehicle running (to keep the interior warm or cool), the quick-stop feature allows you to do this while keeping your keys with you. Safety Brake Pedal Shut-Down: If the vehicle's brake pedal is pressed without the keys in the ignition and the ignition turned on, the remote starter will shut down. Remote Unlocking: Most Hyundai and Kia factory remotes don't work with the engine running. To unlock the vehicle’s doors while the vehicle's running by the remote starter, press and hold the system's remote button down for over 3 seconds and it will unlock the vehicle's doors. Windshield Mounted Antenna w/Built-In Programming Button & Status LED: Commonly mounted on the inside center of the vehicle's windshield directly behind the rear-view mirror for best range, the antenna conveniently incorporates both the system's programming button and status LED. This eliminates any hole drilling in the vehicle and significantly reduces the amount of wire's needed to be run under the dash during installation. Multiple Remotes Capability: The system has the ability to work with one or two additional remotes for a total of up to 4 remotes at the same time (additional remotes sold separately. Discounted remotes w/system purchase offered during checkout). Includes Two 4-Button Remotes that can activate the remote starter and lock or unlock the vehicle from up to 1500' away. 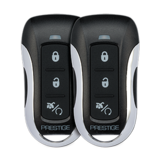 Remote Keyless Entry: Remotely locks & unlocks all the vehicles doors. 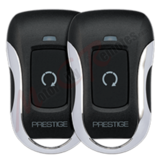 Horn Pulse Activation/Lock/Unlock Confirmation: The system can pulse the vehicles horn when the remote starter is activated (ON/OFF option) and/or when the vehicle's doors are locked and unlocked. Or just pulse the vehicles horn when the vehicle is locked and unlock with a 2nd press of the remote button (silent choice setting option). Power Trunk/Hatch Activation: Can remotely activate OEM power trunk (or hatch) release. Car Finder Feature: Locates the vehicle in crowded parking lots. Pressing the car finder icon on one of the systems remotes will pulse the vehicles horn at a low volume, progressively getting a little louder each time the button is pressed. The vehicles parking lights will also flash as the horn sounds.